The covered bridge, also known as Bridge 202, was originally located at Antelope Creek. This queenpost truss covered bridge was built in 1922, and relocated by the citizens of eagle point to its current location across the Little Butte Creek in 1987. Bridge 202 is one of only 50 covered bridges in Oregon that were originally built to handle vehicles. The covered bridge is the pedestrian and bicycle access across the Little Butte Creek, and very active school route, as the Main Street Bridge is closed to pedestrians. 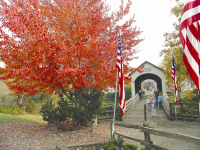 The covered bridge park is also the location of veteran's memorial rocks. Each rock is dedicated with a plaque to each of the major wars.